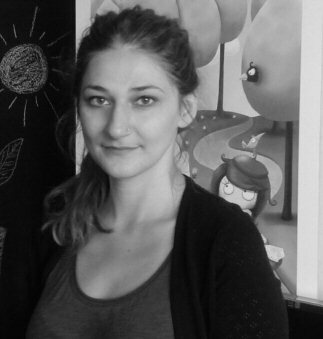 Biography of Jelena Brezovec, illustrator of the children's picture books "My Good Morning!" and "I Don’t Want a Rabbit" published by Clavis Publishing, New York. Jelena Brezovec (1980) was born in Varaždin, Croatia. She studied sociology and croatology at the University of Zagreb, and worked in these disciplines for a few years. For a long time, drawing was just a hobby of hers. But this changed in 2008, when she co-founded Evenio, a company specialized in online, print and digital publishing for children. Today, she works in this firm as an illustrator and a creative editor on projects such as activity books, picture books, mobile applications, digital books and handbooks. Jelena’s work has been featured in various international exhibitions, and her personalized picture book Dance Recital won a National Indie Excellence Book Award in the category Specialty Books.